A Missouri family go about their day-to-day lives in the 12 months leading up to the 1904 St Louis World’s Fair. That is the one-sentence summary of Vincente Minnelli’s musical film Meet Me in St Louis. On a superficial level it seems too low-key to become crowd-pleasing blockbuster, yet upon its release in November 1944 Minnelli’s beautifully observed and pleasant melodrama was not only a huge commercial success – it was the USA’s fifth highest-grossing film of the year – it was the second-most successful MGM release to date (topped only by Gone with the Wind). It firmly established producer Arthur Freed’s musical production unit as the most important department of the studio. It super-charged the career of director Vincente Minnelli, who would go on to direct An American in Paris, The Band Wagon, Brigadoon and Gigi. More than 70 years after its release it remains one of the most popular and beloved Hollywood musicals of all time. The film has its origins in the ‘5135 Kensington’ stories by author Sally Benson. Benson, who was born in St Louis in 1897, started writing short stories for The New Yorker in 1929. By 1941 the magazine had published 99 works of fiction by Benson, including several under the pseudonym Esther Evarts. In June 1941 The New Yorker published the first in a series of eight vignettes by Benson, based around the Smith family of St Louis. The family was a thinly veiled adaptation of Benson’s own, with each story drawn from her own childhood. Benson wrote herself into the stories, using her own childhood nickname “Tootie” for her character, as well as naming the family’s parents – Anna and Alonzo – after her own mother and father. MGM purchased the film rights to Benson’s short stories on 1 March 1942, while they were still being published. A string of writers worked to adapt the stories into a feature screenplay, including William Ludwig and the husband-and-wife team of Victor Herman and Sarah Y. Mason – who had received an Academy Award for their 1933 adaptation of Little Women. Even Benson herself made an attempt, drafting a 198-page treatment with screenwriter Doris Gilbert. In mid-1942 Random House published Benson’s eight New Yorker stories – along with four new chapters – as the novel Meet Me in St Louis. Together the 12 chapters told the story of the Benson family across one year between 1903 and 1904. This serialised structure was adapted by MGM by screenwriters Irving Brecher (Best Foot Forward) and Fred F. Finklehoffe (Strike Up the Band), although in order to simplify the narrative they used seasons rather than months to divide the film’s story. Arthur Freed hired Hugh Martin and Ralph Blane to compose a series of original songs for the film. Martin and Blane had enjoyed some success with their Broadway musical Best Foot Forward, which had already been adapted by MGM. They composed four new songs for use in the film, which could be combined with a number of old standards. Two of their songs – “The Trolley Song” and particularly “Have Yourself a Merry Little Christmas” – became significant popular hits. To direct the film, Freed appointed Vincente Minnelli. At the time Minnelli had only directed two features: the Red Skelton film I Dood It, and the all-black musical Cabin in the Sky. Neither had been a commercial success, however the latter had been critically very well received and suggested Minnelli could easily direct a successful film with the right material. Minnelli had started his career as a costume and set designer for the theatre, and he took that aesthetic focus with him throughout his directorial career. After a disastrous experience at Paramount Pictures he had actually sworn off cinema altogether when Arthur Freed approached him to join MGM. While Meet Me in St Louis essentially featured an ensemble cast, the most prominent role was that of second sister Esther Smith. 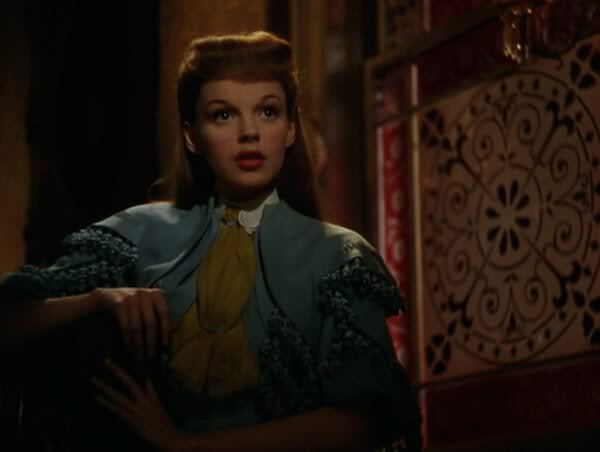 Looking for a ‘name’ actress to fill the part, Freed quickly settled on contracted studio actress Judy Garland. 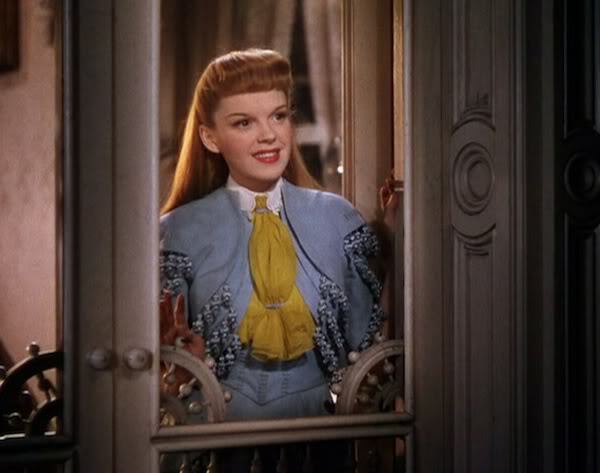 By the time of Meet Me in St Louis’ production, Judy Garland was already suffering significant mental health issues. She had been performing to audiences since the age of three, and acting for MGM since she was 13. Her film career started at a time before strict regulations were established governing how long a juvenile performer could work each day. As a result she was almost constantly exhausted from the studio’s punishing schedule. Later in life Garland would claim that MGM prescribed its actors both amphetamines and barbiturates, although this claim was later denied by her frequent co-star Mickey Rooney. That Garland became addicted to the drugs is historical fact, but who prescribed them or pressed her to take them is unclear. Addictions plagued her adult career, and ultimately ended her life via an unintentional overdose in 1969. At 4 foot 11 inches, Garland was much shorter than the average studio actress, and lacked the expected glamorous looks to be considered a traditional romantic lead. Studio head Louis B. Mayer would refer to her as ‘my little hunchback’; intended as gentle humour by Mayer, but severely damaging to Garland’s self-esteem. As a teenager, Garland’s weight fluctuated. While never overweight, the studio constantly forced her to diet. MGM executives would go so far as to intervene when she ordered food at the studio commissary, replacing her desired regular meals with clear soups and salads. 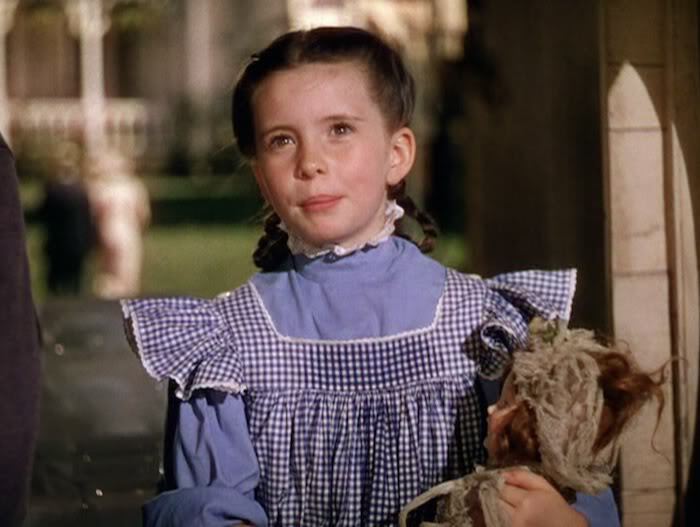 In 1939, the 16 year-old Garland starred in her most famous role: protagonist Dorothy Gale in the musical adventure The Wizard of Oz. While the film initially struggled financially – most tickets sold were at children’s prices – it was a popular hit and launched Garland into genuine stardom. She performed her first non-juvenile role in 1940’s Little Nellie Kelly, and received star billing for the Busby Berkeley musical For Me and My Gal (which also marked the film debut of future MGM star Gene Kelly). The following year she starred in Norman Taurog’s musical Presenting Lily Mars. As Garland grew into adulthood she engaged in a series of emotionally damaging romantic affairs. Bandleader Artie Shaw abandoned her to elope with actress Lana Turner. In 1941 she married the musician David Rose; MGM executives intervened in their initial romance, as he was still married to actress Martha Raye at the time. In 1942 Garland fell pregnant to Rose, but had an abortion. In January 1943 they had separated; they divorced the following year. By late 1943 Judy Garland was exhausted, addicted to drugs, and emotionally fragile. She was in a fresh relationship, in this case with screenwriter Joseph Mankiewicz. One key solace was that she had finally escaped playing children and teenagers, and could at last focus on adult roles – at which point MGM ordered her to play the teenage Esther in Meet Me in St Louis. 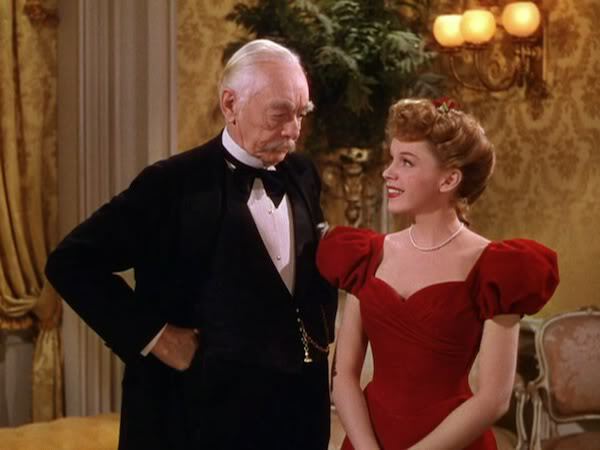 Garland actively resisted being cast in Meet Me in St Louis, disliking both the role – which she understandably saw as a step backwards – and the screenplay. She arranged a one-on-one meeting with Louis B. Mayer to make her case for refusing the film, and he in turn took the issue to producer Arthur Freed. Sadly for Garland, Freed successfully sold Mayer on the film’s merits. Mayer informed Garland she was to star in the film despite her misgivings. Garland moved on to Minnelli, hoping that she could convince him the film was a bad idea and that a period domestic melodrama could be damaging to his developing career. He argued the exact opposite, figuring the film made for a charming and heart-warming story. Left with no other option, a begrudging Garland commenced rehearsals on Meet Me in St Louis on 11 November 1943. Minnelli sought to give Garland a more natural look in his film. He convinced her to abandon using the nose discs and dental caps she had worn in her previous films, arguing that her nose’s natural shape and crooked teeth did nothing to make her look less attractive. The two grew very close during the shooting of Meet Me in St Louis, and married each other soon afterwards. Their marriage lasted six years. 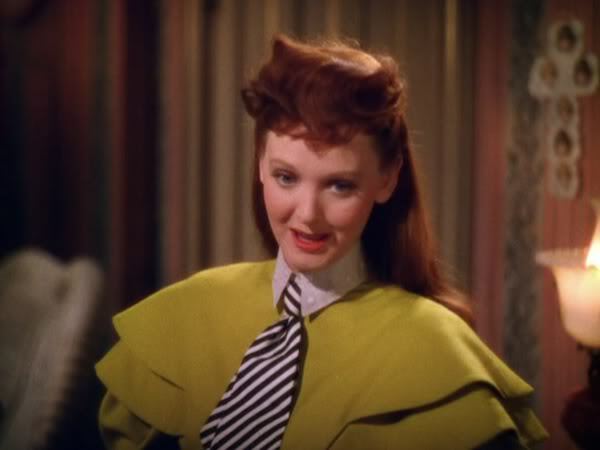 Esther’s older sister Rose was played by Lucille Bremer. A former ballet dancer, the film marked her feature film debut. Following production on Meet Me in St Louis, Bremer was cast opposite Fred Astaire in the unsuccessful musical Yolanda and the Thief (1945). Sadly, when the film collapsed at the box office it was Bremer who received most of the blame. Following an appearance in the musical revue film Ziegfeld’s Follies (1946, but shot prior to Yolanda) and a role in Till the Clouds Roll By (1946), her career in cinema floundered. MGM loaned her out to a string of low budget films at a smaller studio; her final screen appearance was in Behind Locked Doors in 1948. Joan Carroll played the third Smith daughter Agnes. Carroll had spent the early stage of her career as a regular juvenile performer for RKO Pictures. 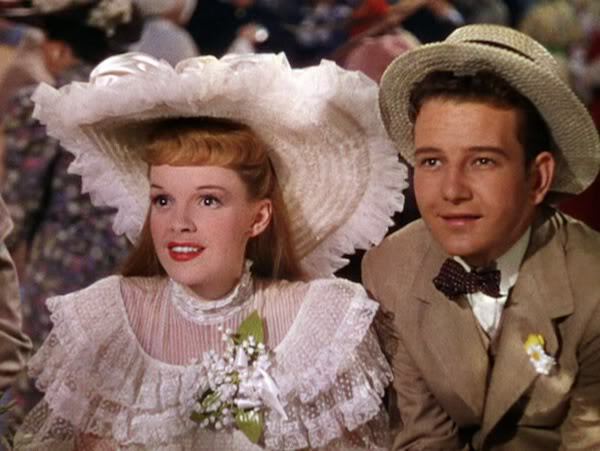 By the time she was cast in Meet Me in St Louis, at the age of 12, her career was already slowing down; after filming The Bells of St Mary’s (1945) she retired from acting. In 1951 she married and would later have four children. 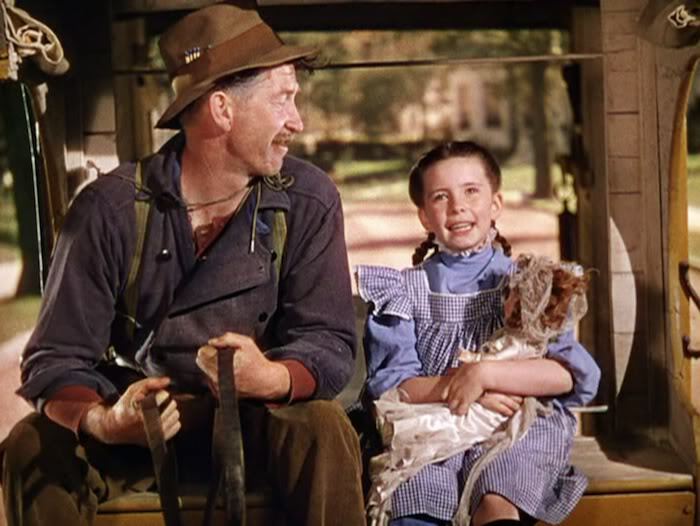 Tootie, the youngest of the Smith daughters, was played by six year-old Margaret O’Brien. At the time of her casting O’Brien was MGM’s most popular child star, having appeared in nine features since the age of three. 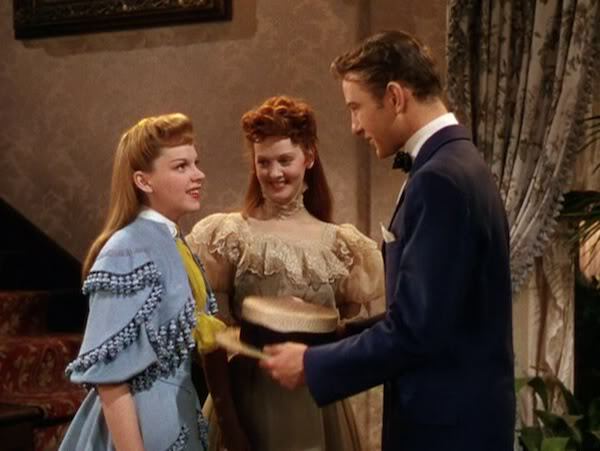 Meet Me in St Louis marked a career highlight for O’Brien, winning her the 1944 Academy Juvenile Award. O’Brien continued acting after childhood, and only retired from performing in 2011. 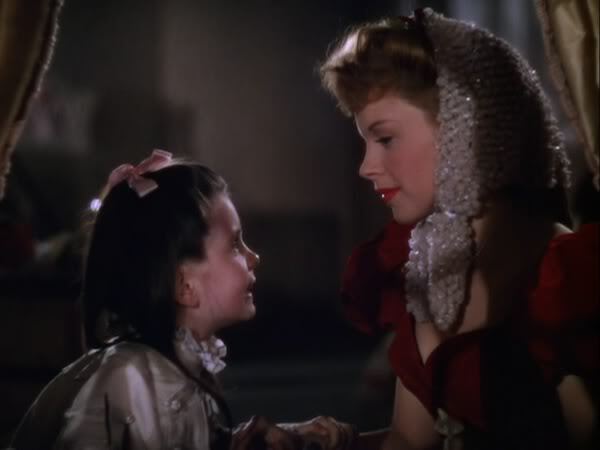 As the studio’s premier child star, O’Brien was seen as the perfect match for Judy Garland in the film, however O’Brien later said she ‘almost didn’t do it because my mother walked into Mr Mayer’s office and asked for more money. Of course, he started to cry. He could do better tears, when you asked for money, than I could do in the film. He said, “No, no, no.”’ An attempt was made to replace O’Brien as Tootie with a young contract player whose father was working as a lighting technician on the film, however Mayer ultimately changed his mind and hired O’Brien at her mother’s requested fee. Mr and Mrs Smith were played by Leon Ames and Mary Astor. Astor began her career in silent cinema. With the advent of talking pictures, she found herself sidelined for a year over claims her voice was too masculine. Despite scandals engineered by her ex-husband during a bitter divorce, her career enjoyed a resurgence in the early 1940s. She became a popular star after co-starring in The Maltese Falcon (1941), and her performance in The Great Lie the same year earned her an Academy Award for Best Supporting Actress. 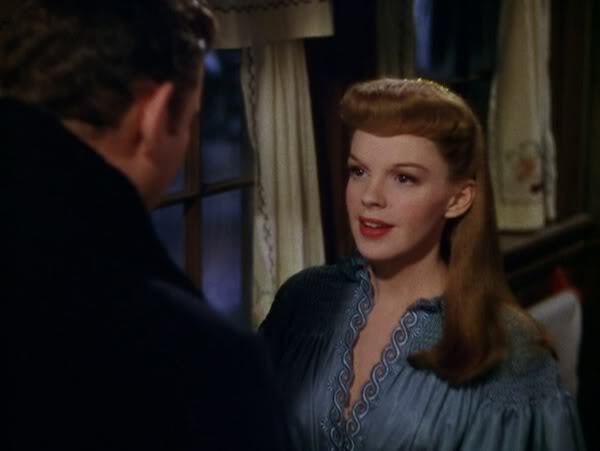 At 37 years old, Astor was only 16 years older than Judy Garland when shooting Meet Me in St Louis. She was only 10 years older than Lucille Bremer. The 41-year-old Leon Ames made a long career out of playing relatively stuffy and reserved fathers for MGM. Prior to Meet Me in St Louis Ames had appeared in such films as Murders in the Rue Morgue (1932), Stowaway (1932), 45 Fathers (1937), and Thirty Seconds Over Tokyo (1944). He would later star in They Were Expendable (1945), The Postman Always Rings Twice (1946) and Little Women (1949). 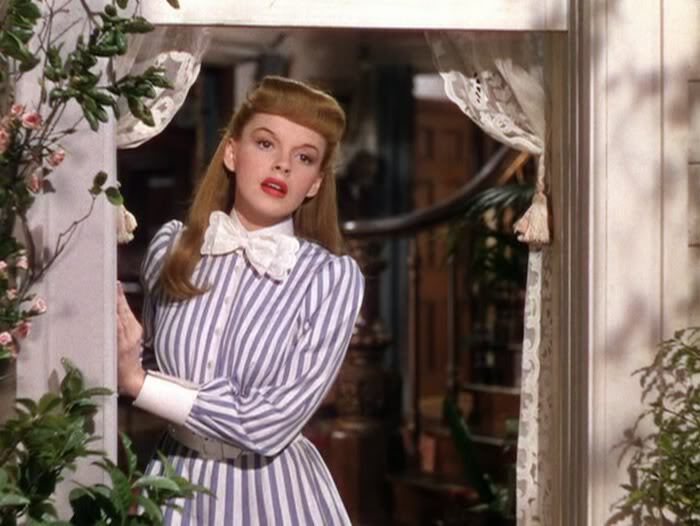 Vincente Minnelli brought a fastidious design sense to Meet Me in St Louis, and particularly to the Smith household – where most of the scenes would be shot. He personally selected many of the household objects, while set designer Edwin B. Willis sourced period-appropriate furnishings and décor. Minnelli demanded a particular style of wallpaper for the house that was no longer in production. It was recreated in New York at a relatively high cost, only for the crew to discover it did not photograph well under studio lights. A more conventional wallpaper was selected instead. 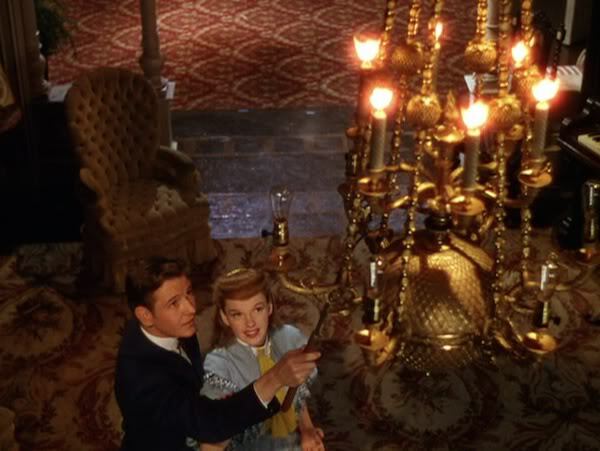 The Smith family’s living room set was re-assembled 16 years later for use in the George Pal science fiction film The Time Machine. Meet Me in St Louis commenced photography on 11 November 1943, with the film’s opening sequence being produced first. The film begins with Mrs Smith cooking ketchup in her kitchen, and as each character in the family is introduced they sample the ketchup and give their own assessment: too sweet, too flat, too sour, and so on. It’s a light-hearted scene that introduces the characters in an orderly fashion and establishes both their personalities and relationships. Once most of the family has arrived home, the film introduces youngest daughter Tootie, hitching a ride on the ice man’s wagon. She is the film’s best character by a long distance. She is wonderfully dark and bleak, foreshadowing the sort of morbid humour audiences would see years later via the likes of Charles Addams and Tim Burton. ‘I expect she won’t live through the night,’ says Tootie of one of her dolls, ‘she has four fatal diseases.’ Elsewhere in the film, when asked a question by her father, she ignores him completely, blurting out that ‘The ice man saw a drunkard get shot yesterday and the blood spurted out three feet!’ Margaret O’Brien’s performance is excellent, and she instils Tootie with a lovely combination of the inappropriate child and the vulnerable one. After filming the film’s introduction, the shooting schedule rapidly started to collapse. Mary Astor suffered an attack of sinusitis and was away for three weeks. 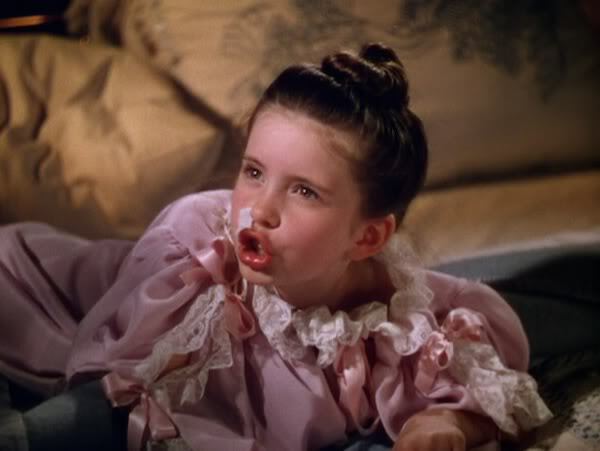 Margaret O’Brien suddenly required dental braces, taking her off the film for a week and a half. Harry Davenport was off sick with a viral infection for a week. Joan Carroll left for an emergency appendectomy, from which she didn’t return for a fortnight. 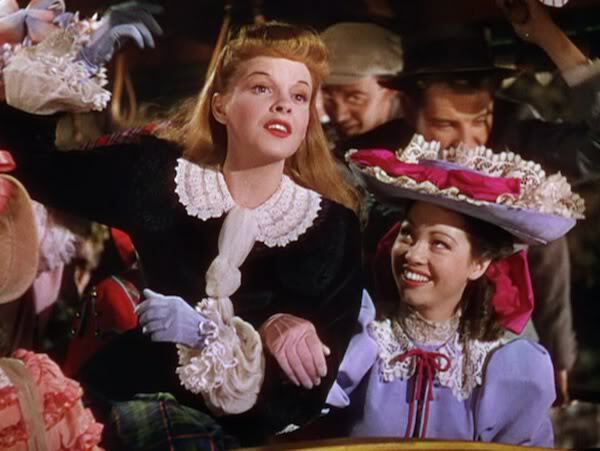 The most absent member of the cast, however, was Judy Garland. A regular series of sick days were made due to a variety of complaints, including nausea, headaches, irritated eyes, sinus pain, and the cold. Minnelli shot what he could of the film around her, but it was rapidly becoming an untenable situation. By the time Garland’s attendance on set was settling down, the shoot was disrupted again when – allegedly on doctor’s orders – Margaret O’Brien took an unannounced two-week break. Her mother, who had been facing growing criticising for driving her daughter to make film after film for eighteen months, took her on a vacation to New York. O’Brien returned to set at the end of January 1944, following a contract re-negotiation with the studio and a substantial salary increase. The Smiths hold a party, during with Esther aspires to romance new neighbour John Truett. Truett was played by Tom Drake. The role had originally been cast with rising star Van Johnson, but shortly before production Johnson withdrew from the production. Born Alfred Alderice, Tom Drake had been excused from serving in World War II due to a heart defect. After performing in a number of British war training films, he returned to the USA to take up acting full-time. Meet Me in St Louis was his ninth and by far most popular screen appearance. The party sequence comprises a number of songs, starting with the society dance “Skip to My Lou”, and progressing through “I Was Drunk Last Night” – sung by Tootie as an entertainment to the guests – and “Under the Bamboo Tree” – a comedic duet between Esther and Tootie. Charles Walters choreographed “Skip to My Lou” in three distinct stages: a square dance, a promenade, and a ‘London Bridge’ formation. He also incorporated moments of character into the routine: a gentle teasing moment from Lon to Esther, Rose flirting with several young men, and John Truett awkwardly failing to engage in the dance. After the dance is over, an amorous Esther persuades Truett to help her turn off the house lights before he ruins the mood by remarking she wears the same perfume as his grandmother. 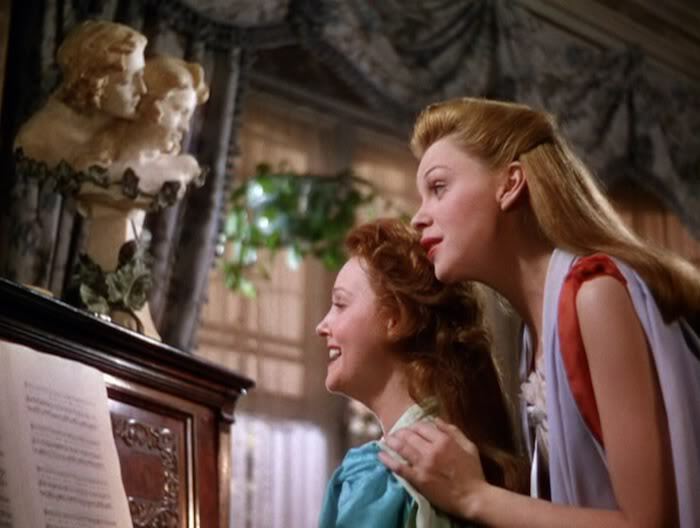 Now is as good a point as any to note that, unlike most Hollywood musicals of the time, the songs in Meet Me in St Louis are primarily diegetic; that is, they form part of the everyday reality of the characters and are not inserted for abstract dramatic effect. For example: a more traditional musical might start a scene with two characters talking, and then their dialogue turns to lyrics, and music fades in underneath them, and they smoothly segue from a conversation to a song. 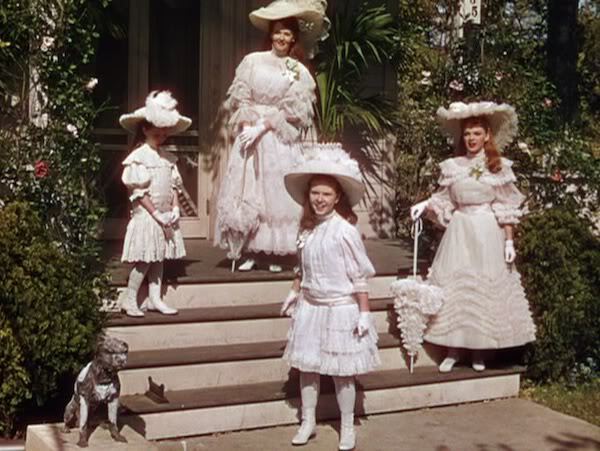 By contrast, in Meet Me in St Louis the characters are actually singing, just as someone in real life might start singing a song to entertain themselves. It is not a universal rule – “Over the Bannister” has a non-diegetic quality – but it does seem to be the overriding state of affairs throughout the film. It gives everything a much more grounded and familiar tone. The additional work – and numerous rehearsal runs – benefits the scene enormously. With no cuts and a gentle tracking motion around the actors, the scene immerses the audience fully in Esther and Truitt’s budding romance. The first take of “The Trolley Song” was so successful that it was the version used in the finished film. 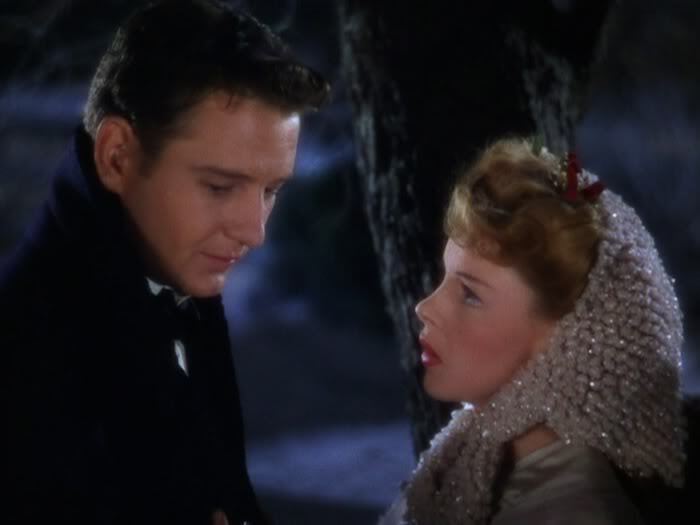 At one point during the shot Garland sang the wrong lyric, but the rest of the scene was so well performed and shot that Freed simply had Garland sing the right lyric when dubbing the audio in post-production. Halloween arrives, and with it a chance for the children to go out guising around their neighbourhood. It is a key sequence for Tootie, who during one night helps burn a pile of furniture on the street, prank calls an old man at his front door, and throws a stuffed mannequin of a human body onto the trolley track – almost causing a derailment and seeing her pushed out of the way by Truett to save her life. It is a striking sequence that stands out from the average scenes of a mid-1940s Hollywood musical. 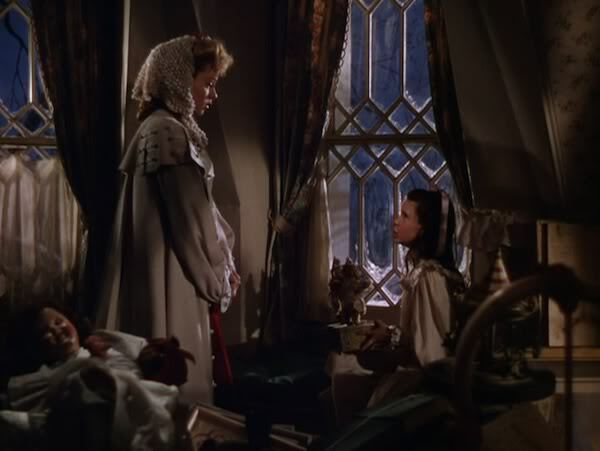 Minnelli shot much of the Halloween sequence from low angles, to give the sense of seeing the scene from the point-of-view of a child. It also visually marks the scenes out from the rest of the film. 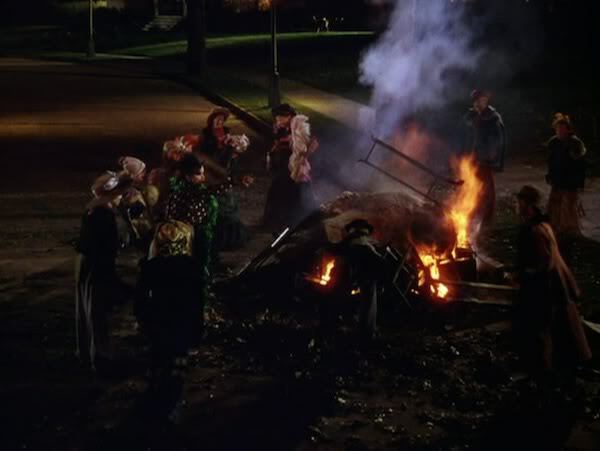 When the bonfire scene was shot, the children were burning stolen furniture and doormats. This was met by resistance from film censor Joseph Breen, who felt that such theft breached the Hays Code that governed and regulated film content. With the excision of a few key moments, the scene was made to seem as if the bonfire materials had simply been donated. Some time later, Mr Smith returns home to announce he has accepted a promotion at work, and that the entire family will move to New York in the new year. His decision is not met with the reaction he expected. Both Rose and Esther are attempting to kindle romances in St Louis, the entire family was expecting to see the World’s Fair, and Tootie is horrified by the concept. With the family all turning against the father, a despondent Alonzo Smith is comforted by his wife. They begin singing together at the piano, and one by one their children come downstairs to join in. It is a beautiful and heartfelt scene, made very real by small touches – after a few bars Mrs Smith drops the key to better enable Alonzo to hit the notes. The song, “You and I”, had been co-written by Arthur Freed with his partner Nacio Herb Brown back when he was a songwriter. 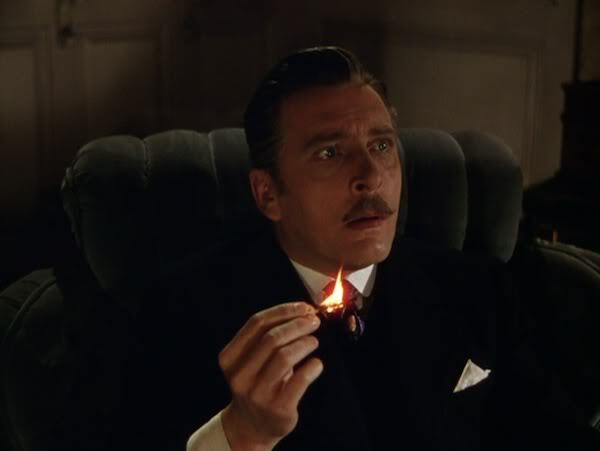 When the time came to dub Mr Smith’s singing, Minnelli did not want to use Leon Ames’ own voice. He felt the character needed a slightly less accomplished singing voice. In the end Arthur Freed stepped in and performed the voice himself. 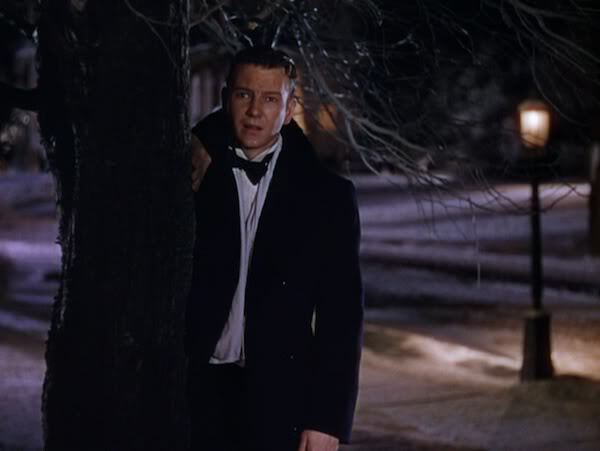 Truett asks Esther to the local Christmas Eve ball, but misadventure leaves him without a tuxedo and he is forced to withdraw the offer at the last minute. A heartbroken Esther is consoled by her grandfather, who takes her to the ball in Truett’s place. Esther’s grandfather was played by Harry Davenport. Davenport was already an actor during the advent of cinema, and made his screen debut in Too Many Husbands (1914). He was widely used in Hollywood in a variety of elderly roles: grandfathers, doctors, judges and ministers. Among his more noted films were The Life of Emile Zola (1937), You Can’t Take It with You (1938) and Gone with the Wind (1939) – all three of which were awarded Best Picture Oscars. By his death in 1949, Davenport had appeared in more than 160 films. 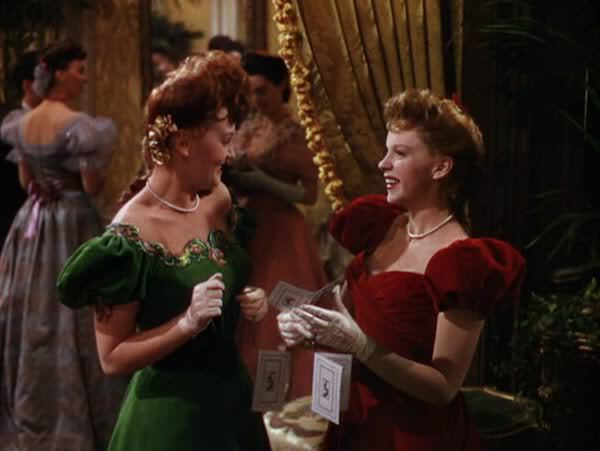 At the ball, Esther sabotages another girl’s dance card to have her spend the night with a series of awkward young men rather than Rose’s intended suitor. When she discovers that the girl (June Lockhart of Petticoat Junction and Lost in Space fame) is actually interested in Esther and Rose’s brother Lon (Henry H. Daniels Jr.), she swaps the cards and condemns herself to a night of awkward dancing. Her night is saved by the sudden arrival of Truett – he got his tuxedo after all – and at the end of the night he asks Esther to marry him. When Esther returns home, she finds Tootie deeply upset at the impending move to New York. As she can’t take her snowmen in the yard with her, she violently demolishes them before collapsing; a sobbing wreck. Esther consoles her with a song: “Have Yourself a Merry Little Christmas”. 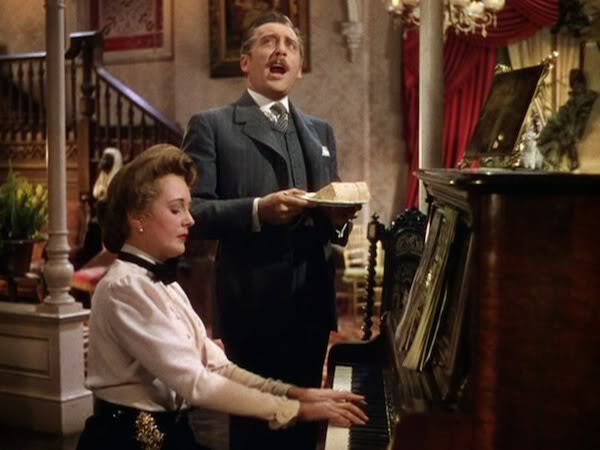 It remains the most famous and enduring original song of the entire film. Blane and Martin struggled with the song’s composition. ‘I found a little madrigal-like tune that I liked,’ said Martin in 1989, ‘but couldn’t make work, so I played with it for two or three days and then threw it in the wastebasket.’ Blane retrieved the melody and developed a set of lyrics to match it. It may be your last. In addition to Drake’s intervention with Martin, Garland had also gone directly to Minnelli to have the lyrics changed. The final version throws a line of hope into an admittedly still quite morose song. The more famous version of the song was later performed by Frank Sinatra, who had the lyrics rewritten to be even more hopeful and upbeat than Garland had managed. While popular, it is the inferior version of the song. The Meet Me in St Louis original works as well as it does because of its ambivalent emotional tone, not in spite of it. During post-production it was found that the film was running too long, and much to Minnelli’s horror Arthur Freed insisted that the Halloween sequence be cut. With Minnelli uncomfortable with challenging Freed directly, co-writer Irving Brecher personally intervened and begged Freed to keep the sequence for one preview screening. That screening, undertaken on 5 June 1944, revealed that the Halloween scenes were particularly popular with the audience. Halloween stayed, and the Rodgers and Hammerstein song was excised from the film’s conclusion instead. It simply concludes with the family together, happy to be staying in St Louis, and marvelling at the lights of the just-opened World’s Fair. Meet Me in St Louis completed production at a cost of approximately US$1.7 million. When released into cinemas, it grossed more than US$7 million. Buoyed by the success of the film, MGM immediately began developing a sequel – Meet Me in Manhattan – that would follow the Smith family to New York after all. The studio had an eye to developing an entire ongoing franchise in the vein of their lucrative Andy Hardy films. The sequel never emerged from development, however, without even a screenplay written before the idea was abandoned. So why, apart from its charming story and strong cast, does the film work as well as it does? How does it successfully hit such a crowd-pleasing and warm tone? Meet Me in St Louis draws a firm and very obvious line between what it perceives as wholesome and old-fashioned family values, and an impersonal and unwanted technological future. The telephone, while reluctantly installed in the Smiths’ house, is seen as an unromantic and crude apparatus. When Alonzo purports to relocate the entire family from St Louis to New York, it seems a terrible calamity: New York is overpopulated, cramped and unwelcoming to families, whereas St Louis is cozy, friendly and overtly ‘American’ in style. The film was released in 1944, at the height of the Second World War, and it is only understandable that audiences would respond so positively to such a nostalgic and homely feature. It deliberately mourns for a simpler, less complicated time, and for a world where families remain united and everybody stays comfortably at home forever. The film’s period setting feeds directly into that nostalgia. Its lead-up to the World’s Fair gives it a sense of an age passing, and St Louis making a one-way transition from community-oriented town to big city at the end of the film. The sense of change is repeated over and over throughout the film, as Rose and Esther find romance, the family prepares to move cities, and characters enjoy the growing new technologies available such as the trolley car and the climactic city lights. In this light Alonzo’s rejection of his New York job offer may be seen as a clarion call to America, to keep its family values intact despite living in a world of constant change and advancement. That message of family over the future seems just as potent for audiences now as it did in 1944. A notable part of this emphasis on small town America is the film’s conclusion. The family assemble and marvel at the World’s Fair lights, but there is no large-scale musical number or finale: simply an affirmation of their values. It is an unexpectedly low-key ending to an MGM musical, and one of the elements that makes Meets Me in St Louis so distinctive. Of course, there are criticisms of the film out there – one of the most common ones being the manner in which the film entirely erases people of colour – but seen within its historical context it remains one of the finest musicals that Arthur Freed’s production unit ever made. Its charm and warmth continue unabated, decades into its life. Quoted in Hooray for Hollywood, BBC Radio 2, 13 June 1976. Susan King, “The spotlight: back to St Louis for Margaret O’Brien”, Los Angeles Times, 25 July 2012. Tiffany Rose, “Hollywood actress Margaret O’Brien: ‘I adored working with Judy Garland’”, Sunday Express, 15 March 2015. Patrick Monahan, “A very merry interview”, Vanity Fair, 25 September 2014. Hugh Fordin, MGM’s Greatest Musicals: The Arthur Freed Unit, De Capo Press, New York, 1975. Quoted in “The story behind Have Yourself a Merry Little Christmas”, Fresh Air, NPR, 19 November 2010. I really enjoyed this review. Again, very well researched and thoughtful.